A pleated, trouser-style pant is a classic look. And adding a pleat to your pants pattern isn't as hard as you might think! 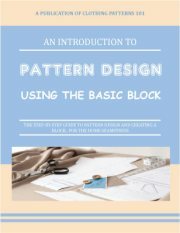 This page shows how to draft a pant pattern using your pant block. Remember to finish your pant with hems and seam allowances! The pleated trouser looks great with a nice blouse and heels or flats. It's a polished look, and it's classic style for women's dress pants that is always appropriate (even when it's not "in fashion"). We'll be adding a bit of fullness through the upper hip, and replacing the darts with pleats. This doesn't make the pants loose or oversized, it just makes the fit a bit more relaxed through the upper hip. The leg shape remains the same as the block. If you choose to alter the leg shape as well (adding a pleat to a tapered or flared leg, for example), add the pleat before changing the leg shape. Draw a line from the bottom of the pleat to the hem (the dart closest to the front crotch curve, if your block has more than one). Then, open the pant leg along that slash line. I've opened it about 2" at the top (between the edges of the dart, at the waist). This will give you a pleat that is 1" deep when folded. The 2" opening at the waist becomes the pleat. When you trace your slashed pattern onto fresh paper (or just tape fresh paper behind the opening to close it up), mark the pleat as I have here - 2 short marks that indicate the width of the dart. When stitching the pant, you'll fold the pleat, matching the 2 marks, and baste across the top to hold the pleat in place. The pleat can be placed with the folded edge facing toward the center seam, or away from the center seam (away from center is the most common placement). If your block only has one front dart, then you're done! If you have a second dart, like the sketch, you can eliminate that dart (you don't really need it). Just re-shape the side seam to account for the width of that dart (the red dashed line near the waist). After re-shaping the side seam and eliminating the second dart (fill it in with paper, as you did with the slashed opening), your final pattern will look much the same as the one, above. Once you're comfortable with how to add a pleat to your front pant, the variations are endless! You can add 2 darts instead of just one (per leg). If your block has 2 darts, make each one a pleat. If you only have one dart, follow the directions, above, for the first dart, then simply draw another line and repeat the process for a second pleat (set the second pleat about 1" from the first one, toward the side seam). Then, if you want to taper or flare the leg, do that after adding the pleats. And remember, changes to the leg shape must be done to both the front and back leg! Before you create these pant styles, you'll need a well-fitting pant block. 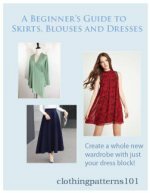 You can create one from a commercial pattern, or draft your own pant block using your own measurements. Check out "A Beginner's Guide to Drafting a Pant Block" Now!